Your website acts as your store front – It’s your customer’s first impression, so make a good one. From the words you use to the imagery, these features all impact SEO. However, even though SEO isn’t rocket science, it is no small task. Having a team of website design and optimisation experts in your corner can provide the boost that your website needed to increase relevant traffic, raise brand awareness and improve user experience through incorporating best practices. We offer a variety of website design services created to ensure your website grows with you. Our robust websites are built with user experience in mind, while keeping in line with your branding and following the latest trends to ensure your website is able to run at its maximum performance and is easy to navigate while keeping the user engaged. Make your website work harder for you with Responsive and UX Website Design Services from Firetap. There are many components that work together to ensure a fully functioning website, from Website Page Speed to Site Optimisation, our Website Design & Build team have years of experience in designing and developing websites, ranging from clean cut to complex, we’ve worked with companies of all sizes. FireTap ensure your website is on brand, keeping your goals in mind while adopting the latest trends to ensure a robust, modern and fully functional website. With the constant increase in mobile users, we ensure our websites are fully responsive, adapting to user devices, as well as up to date, complimenting Google’s ‘Mobile First indexing’. Whether your business needs personalised online portals, blog-style websites or an online E-Commerce store to show off your products, our Developers create bespoke websites, tailored to your needs. FireTap provide on-page website optimisation, as well as off page optimisation. 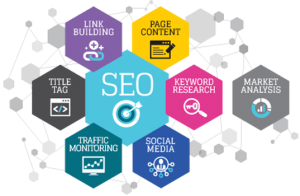 See more about our SEO services here. By ensuring your website includes Keywords that your target audience use to search for your products or services, you are increasing the chances of visibility in Search Engine Results (SERPs). However, Website Optimisation doesn’t end there, we ensure your website has a sufficient load speed, a Site Map so that Google knows which pages to crawl and that all internal links and external links to and from the website are fully functioning and non-broken. Our optimisation team also perform research and analysis to create relevant Meta Tags and optimise images and headings to ensure they match up with what users are searching to increase visibility. Like most SEO Marketing services, they work best with a long-term approach. There are constant updates and trending topics and keywords that should be monitored on a consistent basis to ensure maximised opportunity for increased traffic. Not only this, but many sites are prone to broken links and a reduced page load speed when additional content is added on a regular basis.Our Website Management team can maintain your website, ensuring it runs smoothly and incorporates the latest updates.Our Website services are designed to work in tandem with our SEO services, incorporating best SEO practices to improve your rankings in Search Engine Results and receive more relevant traffic, leading to higher conversions and sales. Everybody wins with effective SEO.